We're honored to feature poems by Austin Beaton in Issue One of Orson's Review. We're also very fortunate for the time Austin took to sit down and chat with us about his journey as a photographer. 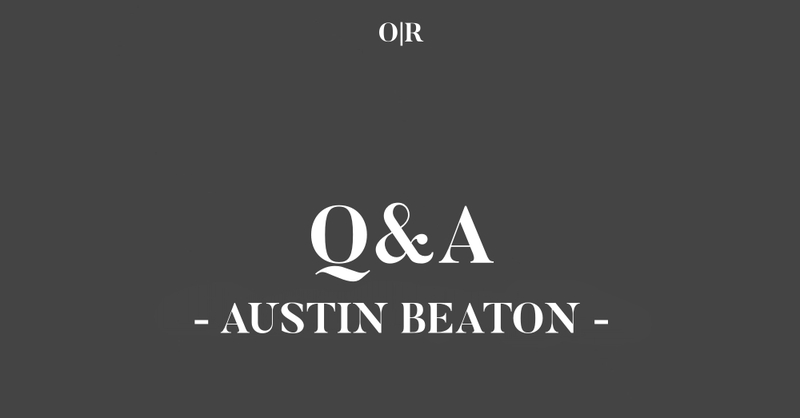 *The following interview involves Orson's Publishing (OP) and Austin Beaton (AB). OP: How did your journey with the written word begin? AB: I wrote stories at home as a little guy, asking my mom to spell words like “Buccaneers” and “Michael Jordan.” Watching and playing sports was my first obsession. Though I loved reading and writing and music it was much easier to sit in my masculinity by pursuing athletics. I didn’t get serious about writing until my senior year of high school in a creative writing class. And though I write poems every day now, it’s been a decade long drama of accepting, rejecting and obsessing over if I I’m a writer, if I could be a writer, if I should write. On and on. OP: Is being a poet your primary occupation? AB: No dice. I’m figuring out how to mix my creativity with my professional, money-making being. Right now I’m an admission counselor at a university. Monday could mean giving presentations about higher education, Tuesday could be copy and pasting data from one spreadsheet to another and Wednesday might be traveling to Austin or Seattle or Bakersfield to visit high schools. Sometimes I’m happy. Sometimes the American capitalism time clock feels heavy. OP: What about "Love Poem in Apocalypse" & "attachment theory" are you most proud? AB: They feel finished! Haha. Little beats feeling as asymptotically done with a piece as you’ll be. But that’s a bit of a cop out. I’d say for these two I like that they’re lyrical and have some mystique about them but remain narrative. The very first poems I wrote years and years ago didn’t have much economy. Readers, including me, struggled to find any cohesive intentionality. Then I swung towards being super straightforward. More and more I’ve caught myself looking to catch the in-between. OP: Tell us about your writing process. Do you approach all pieces of writing in the same way? AB: In the last year-and-a-half I’ve noticed trends. My poem writing will probably always be alien to me. But, right now at least, it’ll start with a moment living on earth. I’ll hear a piece of dialogue (like this girl in a café to her friend last weekend said “don’t you dare sneeze on me!”) or see an image (pomegranate juice under my finger nail) or get a thought (“I’m gonna die!”) that I know I want in a poem. Then I jot it down on my phone or in Google Docs. It’s pretty insane to me. I’ve found if I write every day then those moments will probably come (knock on wood). Finally, when I make time I’ll sit down later and try to string those pieces of language together. Most control of the tone or what the poem’s “about” isn’t mine. This is when the writing happens. Anis Mojgani in a workshop once said he sits down to write to figure out what he’s going to write, like an artist chisels towards a sculpture. I’ve learned and relearned that lesson—it can’t happen only in the head. Writing can’t happen without the writing. OP: As a child, what did you want to be when you grew up? How has that impacted your writing? AB: A top ten story for my mom is toddler me telling her, unsolicited, that I wanted to be an astronaut / clown / dog-catcher. Don’t remember that. Hopefully I wanted to catch the dogs and be nice to them? Then forever the dream was to be a professional athlete. Then an anesthesiologist because of the salary. Then Chemistry and Physics class met me. All the while underneath I wanted to be a writer, but didn’t think I could be. The more I whittle at that disbelief the closer I get to seeing myself writing. OP: Tell us about the biggest sacrifice you’ve made while pursuing writing. AB: Dollars towards submitting poems or chapbook drafts, hours and hours and hours writing, revising. It doesn’t feel like a sacrifice, though. When I write I’m present—a rare reality for an obsessive, anxious guy. Annie Dillard wrote a wonderful book on being a writer called The Writing Life. In it she says, “How we spend our days is, of course, how we spend our lives.” What a line. Cheers to that. OP: How many books do you read in a year? AB: Hard to give a number. Not enough to be impressive and not as many as I want to. I read on my lunch break outside in the California sun and listen to audiobooks while walking to and from the office. OP: Do you attend poetry readings? If so, tell us about the best one you’ve ever attended -- what made it so good? AB: Not as many as I used to. But, yes! They get me high. During my time in the Creative Writing department at the University of Oregon I had stupid luck to see some unearthly poets—Charles Wright, Linda Gregerson, Robert Pinsky. The moments I remember are when the writer says something nerdy or human, offhandedly. Anthony Doerr said something about how writers shouldn’t miss out on their lives. That one rattles around in me. AB: Your honesty and an openness to my honesty. OP: Do you believe that an MFA is crucial to success as a writer today? AB: Not at all. But, from what I’ve gathered, it can make things easier. It offers community, time, funding. I plan to enter a program sooner than later. It sounds like such an adventure! One of my favorite poets, Carl Adamshick, is a sort of Portlander poster child for successful writers without MFAs. Every one go read him now, please (can I say that?). OP: What do you cross your fingers for as a writer? OP: Where do you see your journey with the written word going? AB: To a place where I can spend more of my days talking, thinking and playing about what’s literary. 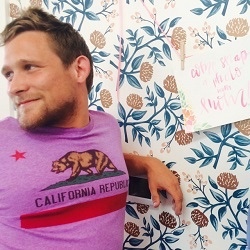 Austin Beaton studied Spanish at the University of Oregon, where he was a finalist for the Walter and Nancy Kidd Memorial Writing Competition in Poetry. His work has appeared in Boston Accent Lit, (b)OINK, Porridge Magazine and elsewhere. He lives near the ocean in San Luis Obispo, California. Be sure to check out Austin Beaton's poems in Issue One of Orson's Review.